Here’s a fantastic thing we made last year, and it’s certainly in keeping with the junk art/stuff you have laying around the house crafting we like to do. All you need is glue, tissue paper, a bit of black paper, old salsa/olives/whatever jars, and possibly scissors. 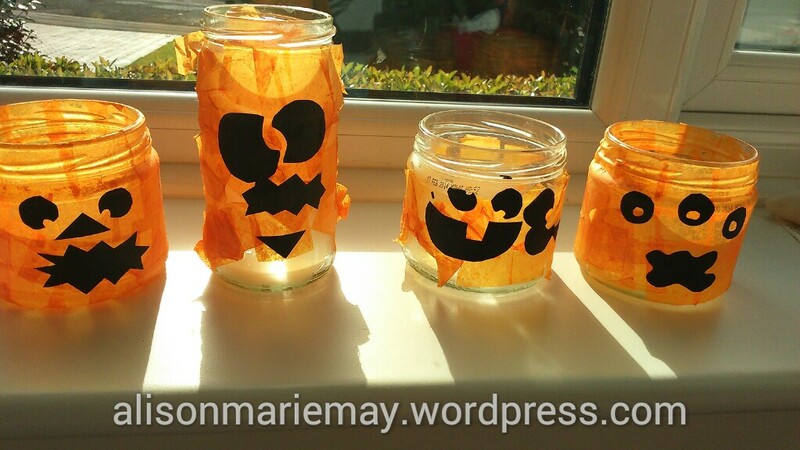 Slather glue on the jars and apply small bits of tissue paper. The more you put on, the brighter the colour. We’ve done jack o’ lanterns here, but it would translate nicely to monster faces, ghosts, the night sky and stars…anything you can imagine, really. And as long as all the tissue paper is on the outside and not on the rim, you can pop tealights in. Pro tip: I bought 78862 battery powered tealights on ebay last year. They’re great as kids can turn on and off at will, with no fire worries. Have fun with this craft! And tweet me at @alisonmariemay if you make it, so I can see! There are two things my kids love: Halloween and collecting stuff as we walk along. You name it, I have it. Bags of conkers, acorns, bark chips, pinecones, pebbles. Conkers are ideal little pumpkins. Acorns make sweet ghosts. And apparently pinecones make good creepers, endermen, and diamond Steves. The undisputed favourite of mine was the hunks of bark (collected off the ground, not ripped off a tree). I’ve painted some as funny monsters, or kids in Halloween costumes. I don’t know what we will do with these. We have a nifty shallow plastic box we may use as a Halloween scene – and we’ve plenty of sticks and twigs to add to the autumnal flavour! Just made the kids something fun to find tomorrow! Not sure I will keep the rules section as is, but for now I’m pleased. 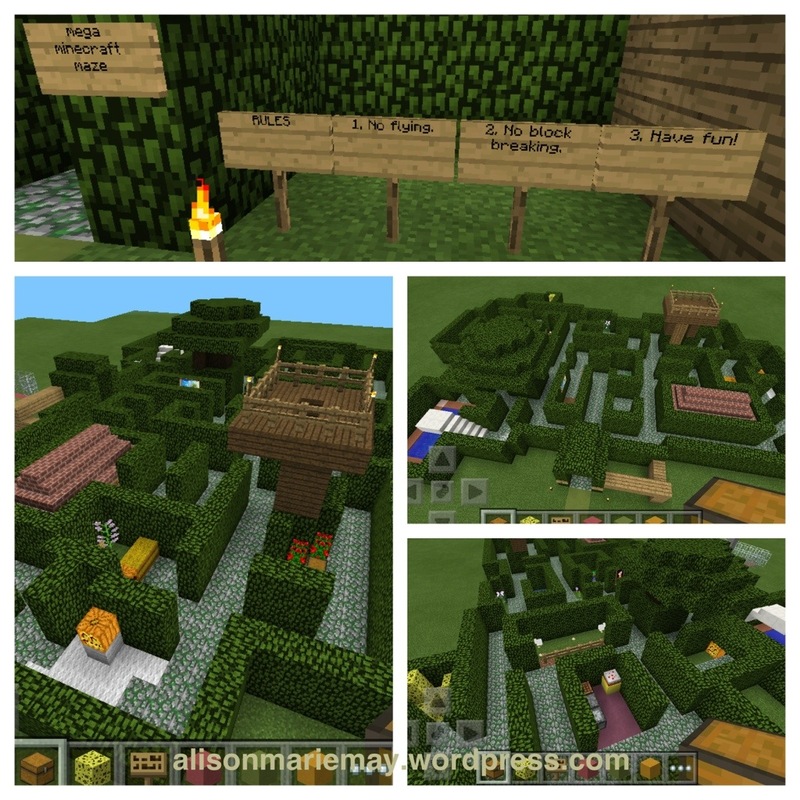 Lots of little nooks and crannies to discover – a house, several gardens, mini art gallery, swimming pool, cheddar cheese area, snowman corridor, lookout platform, survival station, chicken farm, etc. The plan is to add new stuff to our Adventure World map until we have a whole world of awesome – can’t wait to see what the kids build! Have I mentioned I LOVE minecraft? Balloon frenzy (or the day my kids discovered the art of picking glue off their skin). We are lucky enough to live in a city that loves hot air balloons. Spring through autumn (but especially summer), when dawn and/or dusk are clear, dozens of balloons fill the skies. And due to the way the wind blows, they drift right over our house. 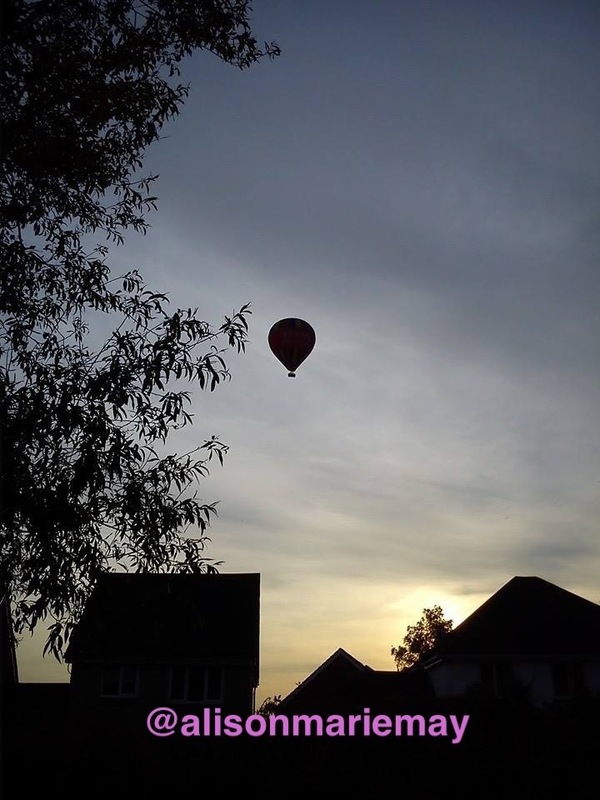 We often wake up to skies of balloons – rainbow coloured, chicken shaped, countless balloons – low and lazy, we can hear the fire and see the flames as they heat the air. And when we go out for sunset adventures, a great summer tradition, they hang low in the sky above. My childhood was filled with memories of watching hot air balloons take off. The high school just down the road from us had a big field, and we’d go down once a week or so to watch the balloons be unrolled, inflated, floating. One landed in the field across from my house one day, and that memory of excitement is as bright as the balloon itself was. Last summer we took the kids to our city’s International Balloon Fiesta. It always happens right around their birthday weekend, and they are already looking forward to this summer. We spent the day in hot sun, picnicking, watching planes do aerobatics overhead, riding Ferris wheels. And at sunset, we watched over a hundred balloons depart the skies. It was amazing. We’ve been having jokey conversations about what sort of balloons we would design – because the balloons in our city aren’t just all colourful, but multi shaped – and so I thought, Hmm. Let’s make some to hang in the house. I cast my memory back to the third grade and some Christmas decorations I made in school, explained the idea to the kids, and we ran out into the garden. Armed with glue, yarn, balloons, empty yogurt pots, tissue paper, and all sorts of stuff. An easy little craft, I thought. And I’ll put up a tutorial once we’ve finished them. But OH THE DRAMA. 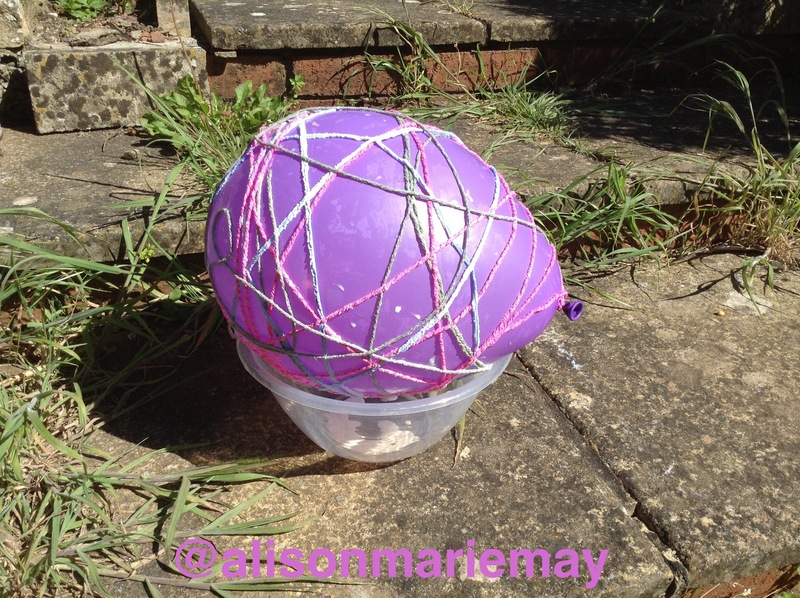 We had popped balloons, glue covering most of our bodies, soggy wet yarn drying itself to the path in big clumpy knots. At one point, little S actually fell backwards into the paddling pool while fully clothed. It was like a bad children’s movie! To her credit and determination, her grip on her wet balloon never faltered and though she was crying and covered in suspiciously green, ice cold water, she held the balloon up and safe. For our physical and emotional safety (only half a joke, folks! ), we’ve decided to leave it for today and do more tomorrow. Don’t ask why there’s only one. What happened to the other one is busy being repressed by the owner of that ill fated hot air balloon. Maybe it’s gone to that clear, lightly breezy place in the heavens. Making a life…one empty yogurt pot at a time. You know how we have cool ideas and then make them? Can we do that? Today she said ‘crafty things’ and I initially thought she said ‘trashy things,’ which made me laugh because it is so apt. So much of what we make is made from ‘trash.’ Empty salsa jars, bottle tops, cardboard boxes. 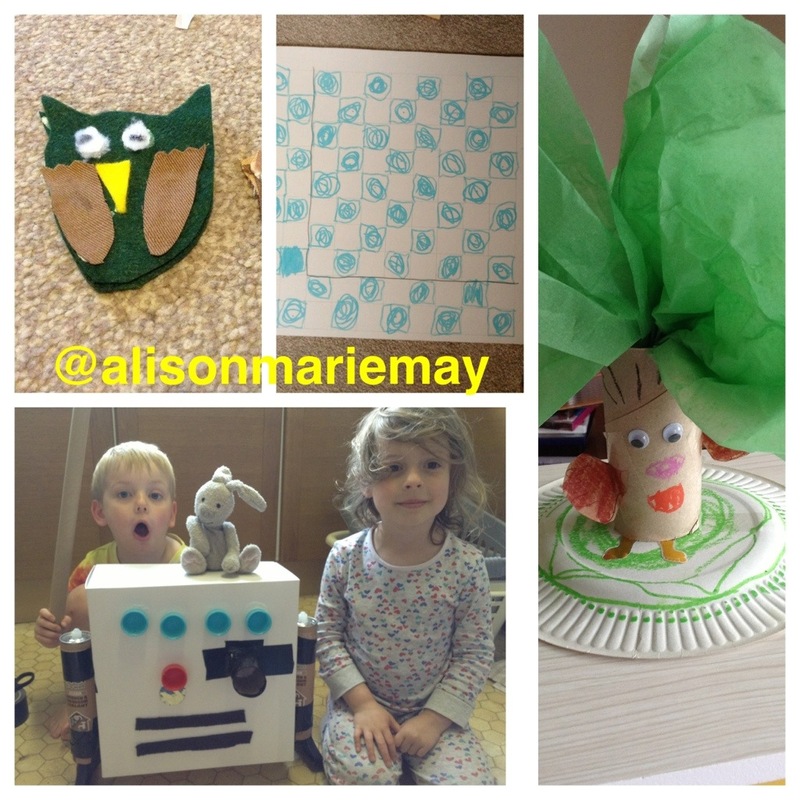 Owl fabric pencil topper, chequers board for bottle top pieces, a cool tree, R2D2. Don’t get me wrong. I’m not the mom who suggests we make huge, awesome stuff every day. No. Most of what we do is led by an interest one or both of the kids have, a specific request, or S’s recent daily requests to make stuff. And I’m pretty good at it. 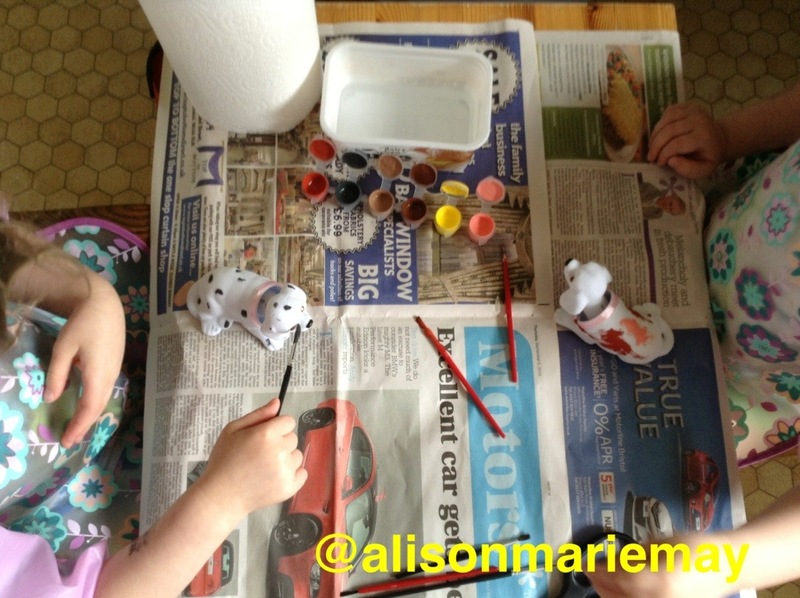 With some mutual creative thinking and hunting round the house for materials, we can usually make whatever we can think of. Suzy takes it to the next level. She’s helped the kids make Angry Birds Star Wars spaceships from tinfoil, a huge dinosaur island habitat from paper mâché, and a puppet theatre and puppets from cardboard and popsicle sticks. I suspect that S will be the sort of parent (if she wants kids, anyway!) who makes elaborate and beautiful things often. She’s got the great combo of being an ideas woman and having follow through. M is similar, though he builds things most often in minecraft or Lego! We are constantly making toys that are made to suit (blue life size light sabres, anyone?). They tend to get played with as much, if not more, as the non-homemade stuff. Recently S made a cardboard airplane hanger and a junk art plane for her RAF bear. M has made a few combine harvesters to chase after Lightning McQueen. These toys are fun because they turn out to be exactly made for purpose, but also because we get to make them. 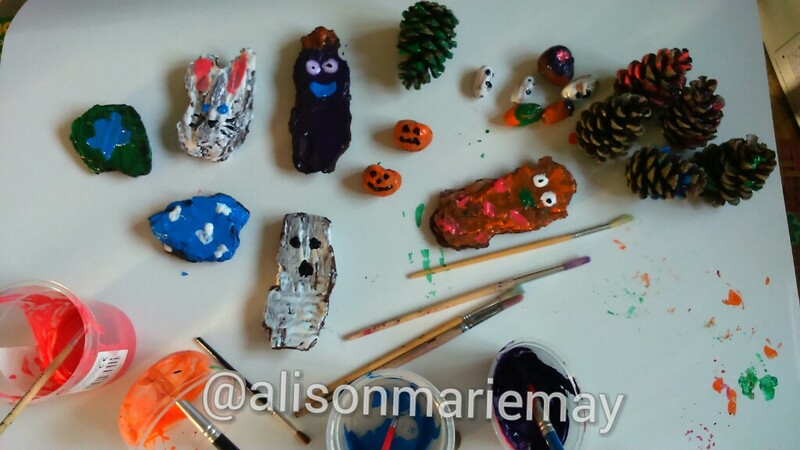 So much of our life is making – toys, crafts. Making recipes, making sandcastles, making friends. 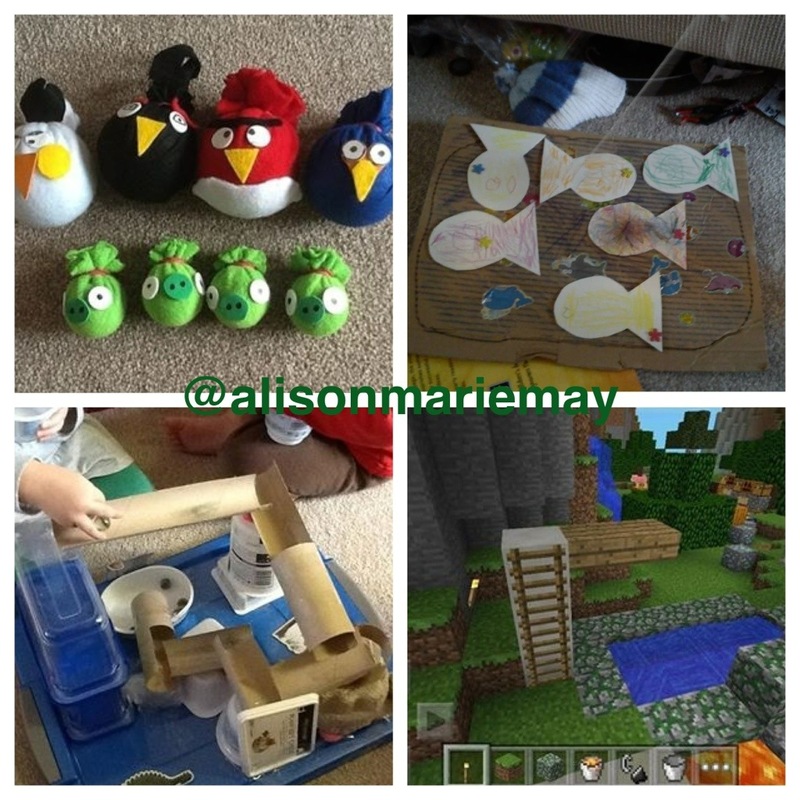 Some of our endless collection of homemade Angry Birds, a magnetic fishing game, a toilet roll marble run, a minecraft diving board. S: M, are you done with the brown paint? M: No. I making my puppy fabulous. S has had a bit of a cold/cough/congestion the past couple of days, and today she said she felt poorly. So we decided to stay home. She asked if we could build something, so we got out our huge box of scrap shop supplies…and then she just kept coughing. Our friends told us about a cool germ experiment, so we did that….and then just kept going. We talked about how you can’t see germs with the naked eye, and agreed to pretend that glitter was germs. 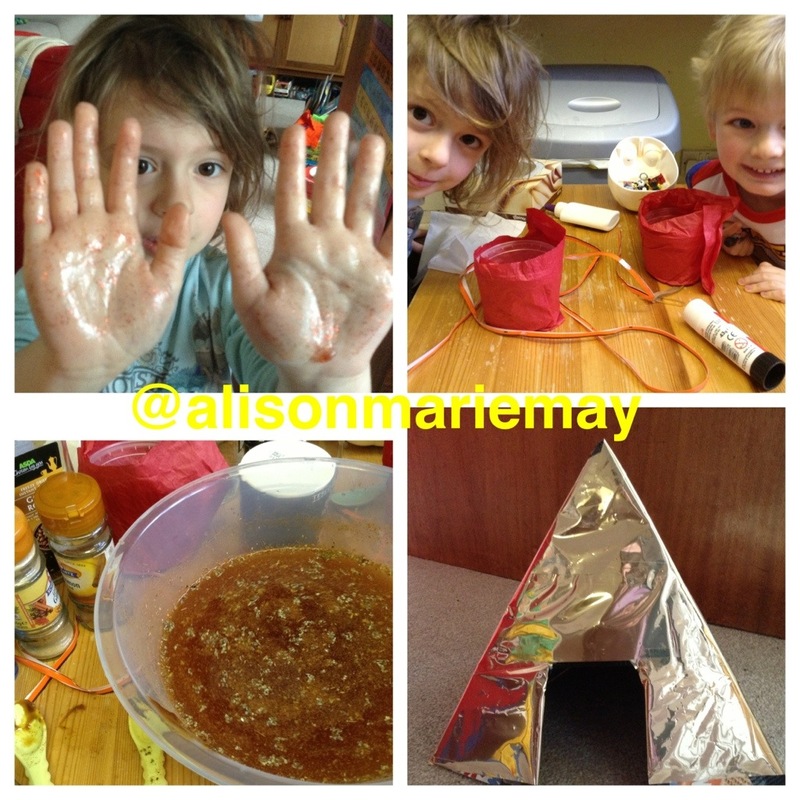 Squeezed glitter glue onto hands and everyone rubbed in in so it was spread everywhere. Then we tested ways to get the ‘germs’ off our hands. Clapping our hands together didn’t work. Neither did plain running water. But soap and water got the stuff right off! This led to discussion about hand washing in general….I must say, I’m relieved it worked. Was a bit amazed the plain water did nothing! Used small plastic pots as our base. Kids decorated with red tissue paper and orange wire/string stuff. Then we added vinegar and baking powder! Wasn’t as big or impressive as I’d hoped, but then I didn’t research it very well. Did make cool bubbling noises, and looked a bit more interesting with red food colouring added. Was also excellent for sacrificing poor lego people in the lava. The volcano thing led to a much loved activity – going through the cupboards to find stuff to mix into our already rancid stale volcano soup. Dumped it into large bowl and let them have free access to the spices….and coffee…and marmite. THIS IS THE ULTIMATE ACTIVITY. But perhaps not for those with strong gag reflexes! M found some shiny gold paper and said we needed to make a pyramid, like the Eygptians had, and cover it in gold. No idea what sparked this, but the use of grown up scissors, various types of tape, and Shreddies boxes made this a very fun thing to make. And it looks awesome. It makes me feel like I imagine parents who take Pinterest seriously might feel upon completion of a cool project, right before they open a pyramid themed Etsy shop.